"Real education is [not] looking up factoids about the world." I haven't updated this blog for a while. And there is a reason. It seems the internet more and more is becoming a echo chamber, everything that is said by let's say an authority, then is criticized or commented internet-wide. However, we still can find very original content and ideas as Daniel M. Russell reflects. 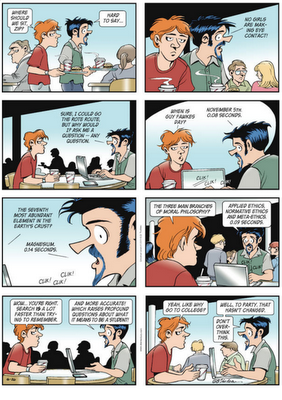 He relates to a Doonesbury cartoon to discuss and explain the fundamentals of education. Russell goes on to plainly disagree with the misconception of digital literacy applied to education. In place he suggest we should mention 'information literacy'. The term 'digital', suggests the expert on research, is a descriptor and says nothing about strategies and tactics. Beyond that, not all information is digital, some of it is not, and the concept of information literacy transcends any particular medium. Know when to stop searching and find a human expert on the topic. "Rapid lookup is a great tool, but it’s NOT education or learning in any meaningful way. The framework that organizes all those factoids and inter-relationships IS education—it places all the bits and pieces into context and lets you understand the structure and functions of the world. In general, someone needs to teach students that just looking up X isn’t the same as understanding the context of X—where does X come from, why is it important, what super-categories of X exist, does X vary from culture to culture?" And the dealing with the over saturation of information on the web. "The rise of increasing amounts of online information should INCREASE our teaching of information literacy, not decrease it. Sure, many K12 teachers teach a bit of how to work in an online world, but the education is spotty and in many cases not especially good." A sophisticated learner then, is not just the one who knows how to look up something, but someone able to ask the right questions at the right time to advance his understanding. Paraphrasing the the author this great article, the research scientist, Daniel M. Russell.